10am - We had a swell 2-day Camping Trip. Now it's time to return home to our Twayler! During these two days, we found that camping with Scampy is sooooo comfortable and easy. There is plenty inside storage to have a place for all of our stuff. Converting the table to our bed is fast and easy to do. We have purchased a bunch of small containers from The Container Store to super-organize all our stored things. From tooth brush to can of peanuts! 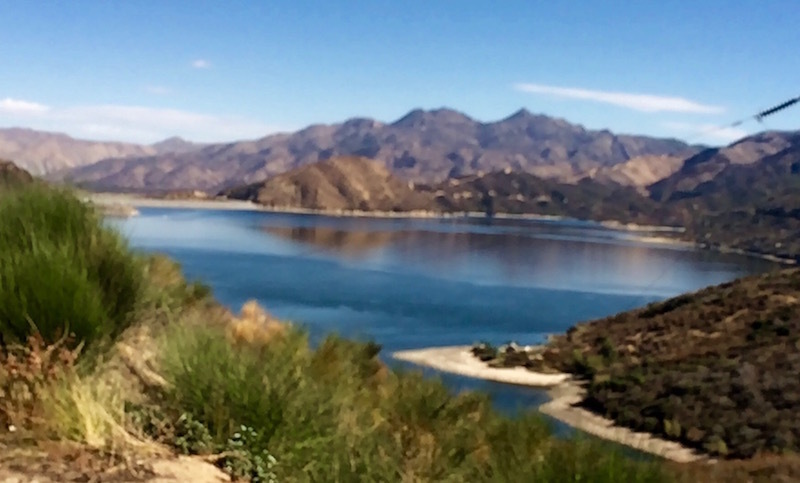 We came to the Silverwood Lake turnoff, and decided to have a look-see! Everybody on The Team was anxious to make a camp at Silverwood Lake. However, the State of California, in its infinite wisdom, decided that none of the campsites would have a lake view! And further, California wanted $45/nite for a dry campsite! Can you imagine that? So, we on The Team. took a yes/no vote. NO, won! Pacific Crest Trail Campsite. Not for Scampy! Scampy and everybody arrived home safe and sound. We believe that Twayler may have missed us. But, we are not absolutely positive about that. Our flowers in the front yard seem to be doing quite nicely. Except for the Ficus Benjamina which fell over because of wind. And nobody was here to right the little tree! This is sooo much more fun than apartment living. Tioga George is back out there finding adventure! We really missed finding adventure. So good to be back! There is really nothing like camping to enjoy you life. glad it is going so well for you. We are happy for you George, you are back doing what you love! Yes! Doing what we love. That is sooooo true! Glad you had a good time. Much nicer to sleep in a bed. Isn't the container store wonderful!!! We DID have a good time. You are sooooo right about that. And now Boid and I are pals because we spent so much time very close to each other! That Container Store is a blast! 😀 How did we ever get along before Container Store? Best website on the internet for finding free and almost free camping. Twaylor will be happy you're home! The truth about my finding places to camp is, that I do not want to know anything about where I am headed. Just go and look around. That's it! Twayler is one good Home Base! That's for sure. I had a funny feeling that Fit would be "fit" for the job. What a great combo. Yes! So far, Honda FIT is doing a great job towing Scampy!